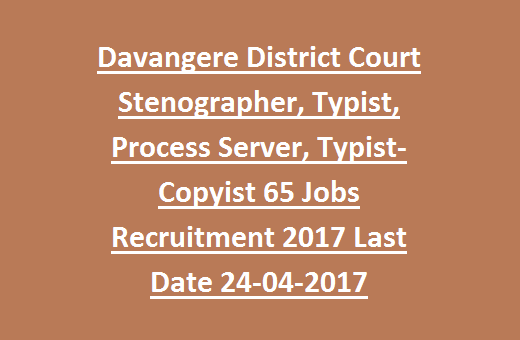 Typist Jobs in District Court of Davangere Recruitment 2017. District Court Recruitment 2017 are 65 posts. Process Server: SSLC qualification required. Stenographer: Rs.14550/- to Rs.26700/- plus GP. For Cat 1, SC, ST candidates is 40 Years. Rs.100/- and for SC/ST/ PH candidates is Rs. 50/-. be shortlisted based on the performance in qualifying tests. Admit Cards will be available 15 days before the date of Exam. Sessions Court office of Davangere on or before 24-04-2017. Download the application form and Notification for District court of Davangere Typist Jobs Recruitment 2017.